Lynn blogs at WindRryder Dreams where you can see more of her beautiful creations! How long have you been stamping? My first real experience with stamps was a CTMH party held at a friend's scrapbook store. I was a scrapbooker for years and had only actually stamped at the parties. 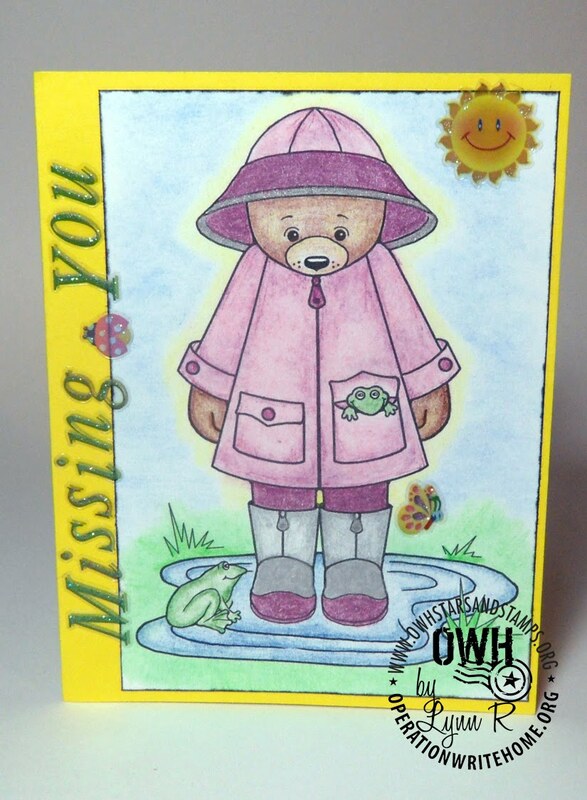 I did take a few classes with Michael Strong in San Diego and fell in love with the creativity of these mini pieces of art, but, never felt drawn to making cards until a few years ago. Do you have a craft room or specific area where you stamp? I have a very small room, about the size of a walk in closet. I have it packed full of everything from my card supplies to quilting and beading as well. What are your favorite stamp products? I think I like the shimmery inks, embossing powders and Perfect Pearls. OH, yes, I really do like the clear stamps as well. What a great invention! Do you have a favorite technique? I don't know a lot of techniques, but, I do like chalking, applying ink directly to the paper and heat embossing. 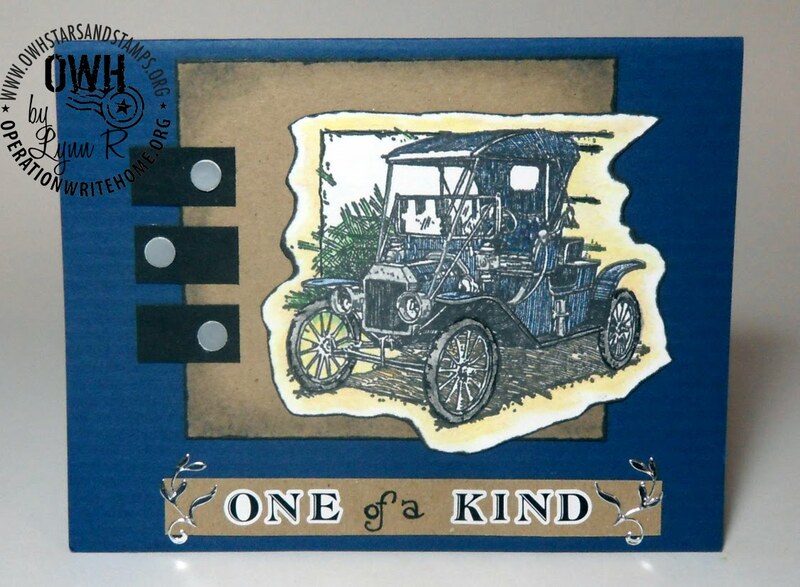 I also love to use anything and everything to make my cards, my favorite being magazine images mixed with stamping, using recycled items and everyday things like split peas, silver coffee seals and sawdust. Are there colors you love to include on your cards? I am drawn to blues, purples and greens, but I do try to just go with the right color for the subject or theme. How did you hear about Operation Write Home? Actually, last October I did a search on the internet to find a charity or program that was related to helping Vets or deployed servicemen and women. This came at a great time since I was laid up with a broken femur and had very limited supplies to play with. What motivates you to make cards for our heroes? 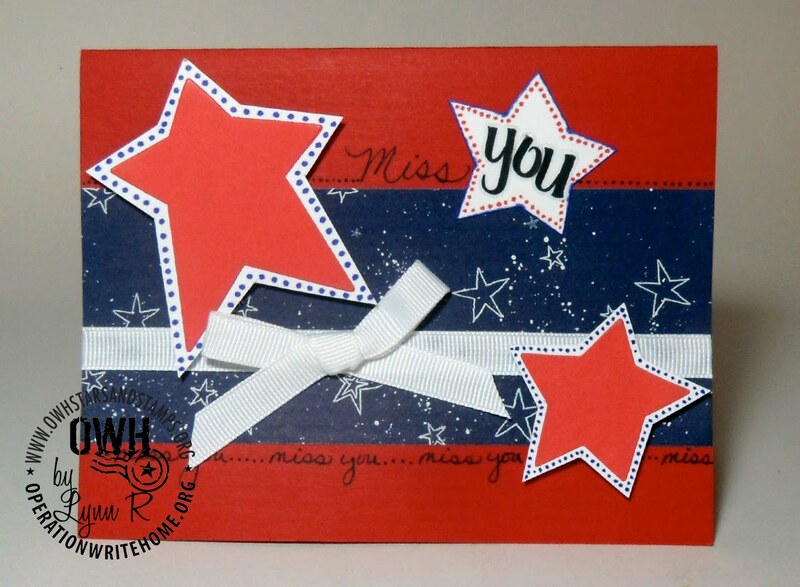 I am a Vet as well and I make cards to let Heroes and their families know they are not forgotten. I am part of a military family, my uncle, my father, a brother and now a niece who just returned from Afghanistan. She was lucky enough to get cards from OWH and appreciated them beyond words. I think it is important that Americans everywhere (I actually live in Canada) make every effort to let them know that they matter. Cards are the least I can do. 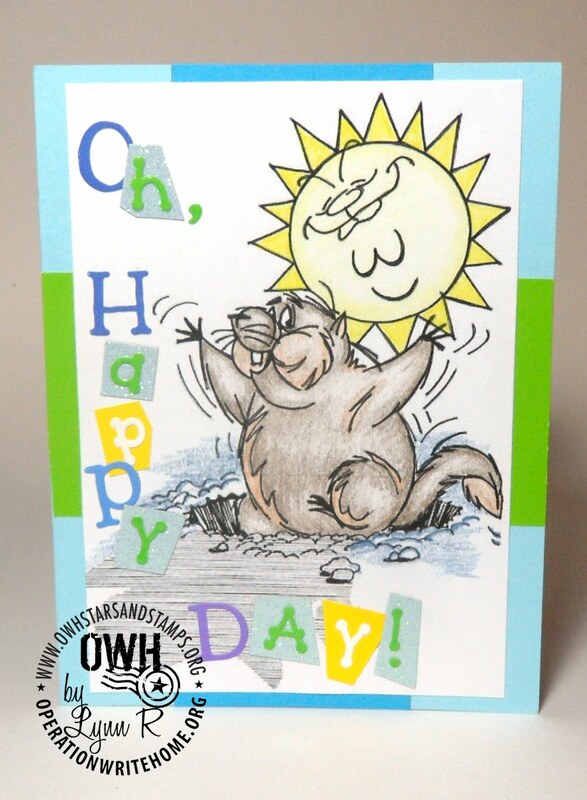 Lynn's cards are so cute, we know you're going to want to use one of hers as your inspiration today! Pick one to CASE - colors, design, whatever inspires you! Leave a link here so we can see what you've created! Thanks for sharing all the wonderful inspiration! Lynn's cards are all very creative and I'm happy I stopped by to see them today! Hope everyone is enjoying all the fun challenges and I'm hoping I can still enter a few more. Happy Crafting and Happy Weekend!! Wonderful cards Lynn! Thanks for sharing your story with the OWH family of card makers and for your service. 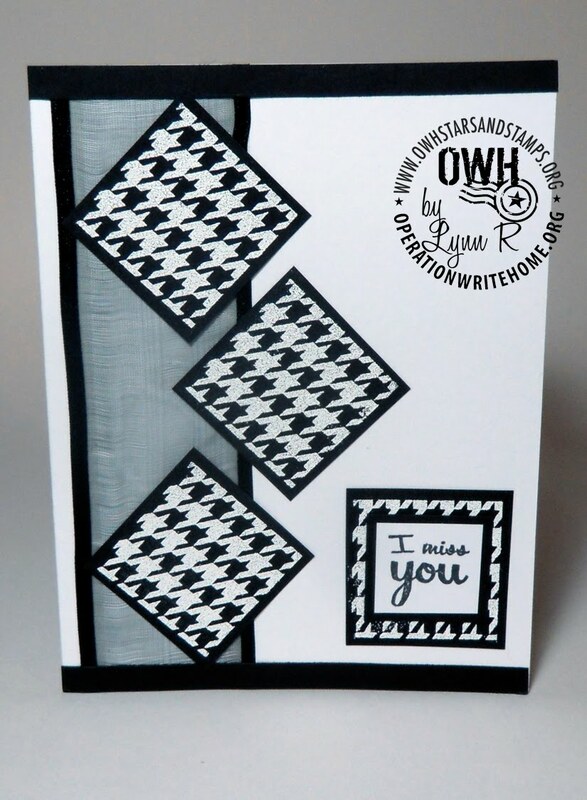 great great cards - LOVE the black and white... that is the one that I am going to CASE. from one Vet to another - thanks for your service! I love the cards. I am gong to CASE the black and white one for sure. What size are the squares. I thought It would make a cute christmas card and use up lots of scraps. Great job. I'm so glad you featured Lynn. She puts her all into her cards and it shows. A real treat for our heroes! Your cards are beautiful, Lynn; thanks for the good ideas!